My electric oven takes an additional like 30 min to bake. Place whipping cream in a small, deep, chilled bowl. Add the 2 tablespoons sugar, vanilla, and cinnamon; beat using a mixer with chilled beaters on medium-high speed until soft peaks form. 2. Whisk together pumpkin puree, egg yolks, and egg in a large bowl until smooth. Add sweetened condensed milk, cinnamon, ginger, salt, nutmeg; whisk until thoroughly combined. 3. 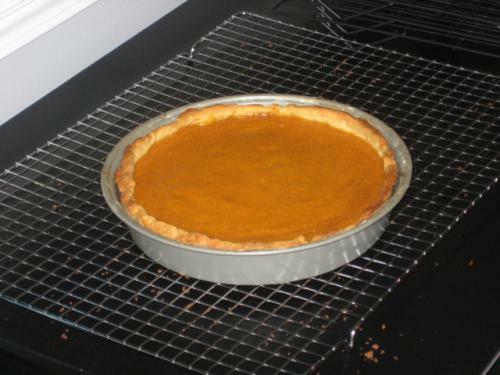 Fit pie crust in a 9-inch pie plate and crimp edges. 4. Pour filling into the pie shell and lightly tap on the work surface to release any air bubbles. 5. Bake in the preheated oven for 15 minutes, bottom rack. Reduce heat to 325 degrees and bake until just set in the middle, 50ish minutes. A paring knife inserted into the filling, 1 inch from the crust, should come out clean. Allow to cool completely before serving.